Happy St. Patrick’s Day! Let’s get lucky. | I'm Gonna Cook That! Happy St. Patrick’s Day! Let’s get lucky. 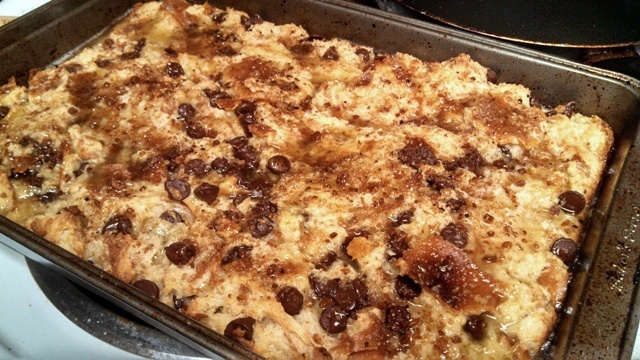 Last week, Sweet and Crumby attempted to make a lightened up version of this delicious Irish Whiskey Bread Pudding. It seems she has the same problem I do. We start out with the best of intentions, and then before we know it we’re adding all sorts of goodies that cause our recipes to take a bit of a detour. I’m not mad at her though, because the moment she admitted to throwing caution to the wind and simply focusing on making a really delicious dessert, I quite happily followed her lead. I didn’t detour too much from her recipe, and I recommend that you click that link up there and go check out the original. I’ll walk you through it though, and include the very minor changes I made (some on purpose, and one completely accidental). This recipe is easy enough to throw together that you still have time to make it in honor of today’s St. Patrick’s Day festivities, but I think once you’ve made this once, it’ll be a popular repeat in your dessert rotation. I was prepared enough to buy the bread a few days in advance, but not prepared enough to get it torn up and air dried ahead of time, so I dried it out a bit in the oven. 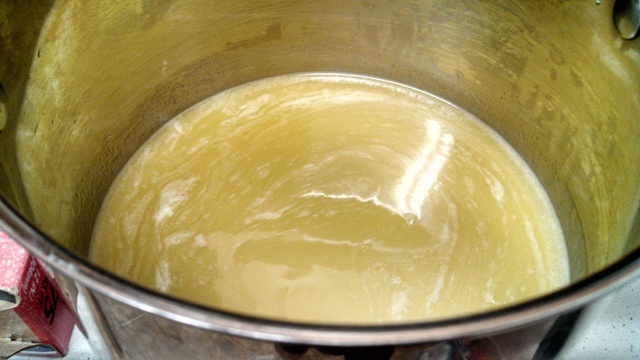 Dry/stale bread soaks up the custard much better, while still retaining its basic structure. Her recipe calls for the bread to be left in slices and drizzled on both sides with the melted butter then put into the oven to toast. I melted the butter but totally spaced actually putting it on the bread, so I ended up just pouring it into the custard. What the hell, right? Anyhoots, it won’t take too long to get the bread just dried out enough to be more absorbent. Remember, you’re not really trying to brown the bread, just toast it up a bit to accept the custard. While the bread is drying, you can mix up the custard. 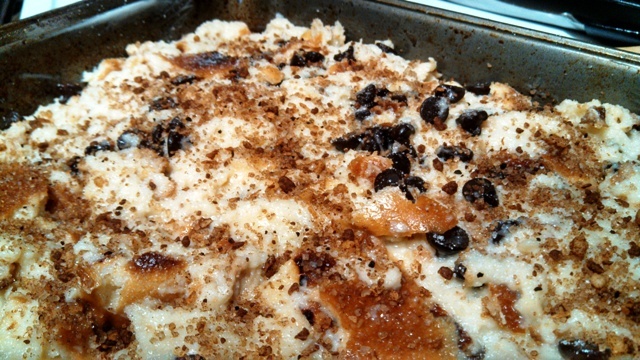 In the original version, you’d put the raisins in the whiskey ahead of time to help plump them back up, but since I skipped the raisins I just poured it directly into the custard mixture, along with the milks, eggs, vanilla, and sugar. Dump your dried out bread into the custard and very gently fold it to combine. You don’t want to break those chunks of bread up too much. 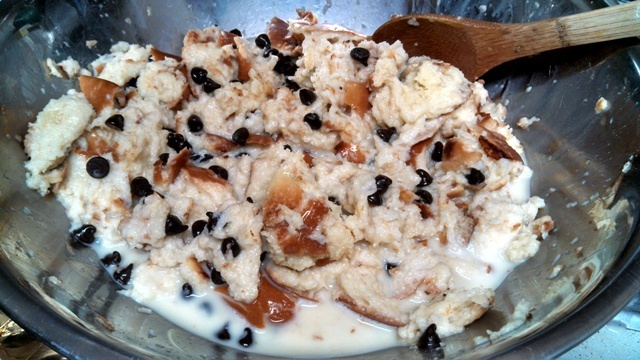 Add the chocolate chips and fold them in, too. Food Made Simply has a great explanation for the difference between stirring or mixing and folding here, if you’re a little confused about that. Basically, folding is much gentler and helps to ensure your pudding isn’t going to be over-mixed into mush. Use cooking spray or butter to lightly grease your pan, then pour the mixture into it. Spread it out a bit to get it into an even layer, but don’t smoosh it down too much. Sprinkle your cinnamon/sugar mixture over the top and pop it into the oven for about 30 minutes. While it’s baking, you can get the Whiskey sauce together. Melt the butter in your sauce pan, then add the remaining ingredients. Cook and stir or whisk for about 5 minutes over medium heat, until the sugar is all dissolved and the sauce comes to a boil. Here’s where the strainer comes in– My egg yolk started to cook a little. If I had been thinking about it, I probably would have tempered it a little to minimize the chances of that happening, but if the same thing happens to you don’t panic. Just let the sauce finish cooking and then strain out any bits of egg before you serve it. I brought mine into work, so I just drizzled the sauce over the top of the whole thing, but if this is something you’re making to serve after dinner you can just serve it on the side. If whiskey isn’t your thing, but you still want to get in on the St. Patty’s dessert parade, Sweet and Crumby’s blog post from March 12th has a recipe for Bailey’s Chocolate Devastation Cookies that might be a little more up your alley. Yum! ← Damn, Herbs… You is fiiiiiiiiiiine! Pingback: I am not a morning person. | I'm Gonna Cook That! Thank you so much for the shout out and I’m so glad you enjoyed it.